Entity Framework Core (EF Core) is a new, ground-up rewrite of the highly successful Entity Framework 6 (EF6.x) database access library for the .NET platform. 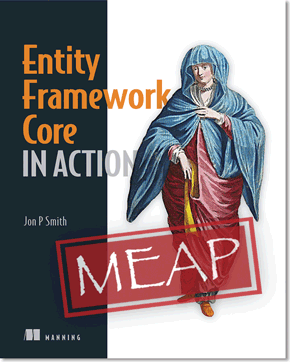 I have been commissioned by Manning Publishing to write a book on EF Core called Entity Framework Core in Action. In writing this book I have looked at any and all aspects of EF Core, and I am really impressed with the topic I am going to cover in this article, that is, Client vs. Server evaluation. Client vs. Server evaluation is a feature that makes it easier to write queries to the database, because it allows you to include methods in your query that cannot be run on the database, that is, methods that EF Core cannot convert to SQL commands. In my Entity Framework Core in Action book I am writing I use a database containing various technical books as an example (seemed appropriate) – you can see a live site at http://efcoreinaction.com/. The diagram below shows you just the the Book table with a many-to-many link to each Book’s Author(s). 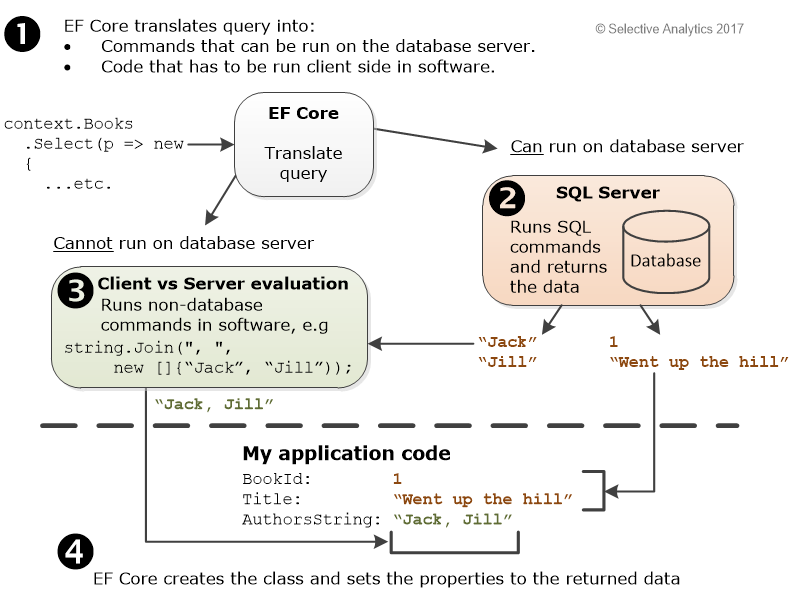 What happens is that EF Core converts the query into SQL to run on the database, but one method, string.Join, isn’t supported as a SQL command by EF Core’s SQL database provider, and at this point Client vs. Server evaluation comes in. Commands that cannot be converted into SQL, so therefore must be run in software in the application, known as the client. The figure below gives you a better view of this process. This shows the effect of running the EF Core query I just listed on a book that had two authors, Jack and Jill. As you can see Authors property will be set to “Jack, Jill”, while the BookId and Title would be set to the value of the corresponding columns in the Books Table. Stage 1, the translation of the LINQ query, is where (with the help of the database provider) EF Core splits up the LINQ commands and other methods into either “run on database” (Server) or “run in software” (Client). Stage 2 is where the SQL commands are run on the database server and the values are read back. The SQL that EF Core creates is given below. Note that EF Core always reads collections using a separate SQL command (EF6.x would have output one commands to read it all, but that can be inefficient in cases where the collection is large). Stage 3 is run because EF Core detected commands that had to be run on the Client. It gets the data it needs from the SQL data and runs the software-only methods on the Client. In stage 4 you see that EF Core combines the Server data and the Client data and provides the composite data back to the caller. The Client vs. Server evaluation feature gives you as a developer the ability to create complex queries, and EF Core will optimize the query to run as much it can on the database Server. But if there is some method in your query that cannot be run on the database server then the query won’t fail, but EF Core will apply that method after SQL Server has done its part. The example I showed is simple, but the possibilities are endless. But there are a few things to watch out for. What about Entity Framework 6.x (EF6.x)? The Client vs. Server evaluation feature is new in EF Core, and is not available in EF6.x. This means that I have to add extra stages in my query if I want to use methods such as string.Join. This makes it harder work in those cases. Obviously in EF Core this gets easier. If you are still on EF6.x then I can recommend Alexander Zaytsev’s DelegateDecompiler (DD for short) which provides a similar feature (see this article, where I use the DD). While I have used DD, it does require me to add a command at the end of every query. Also DD is not (currently) available on .NET Core. I think the Client vs. Server evaluation feature is a very useful addition to EF. But, like all powerful features, it is best to understand what is going on so that you can use it in the right way. Firstly, the obvious thing is the method you provide is run on every entity (row) you read from the database. If you have 10,000 rows in the database and don’t filter/limit what is loaded then, as well as a SQL command that takes a long time, your processor will spend a long time running your method 10,000 times. The second point is subtler: The Client vs. Server evaluation feature blurs the lines between what is run in the database and what is run in the client. It would be possible to create a query that worked, but was slower than it could be because it had to use client-side evaluation. To give you some context, in EF6.x this form of mixed client/server query would have failed because it did not support that. That meant in EF6.x you had to do something about it – often by changing the query to better suit the database. Now your query may work, but could perform worse than one you write such that EF Core can convert it directly to SQL commands. One extreme example of the problem is that Client vs. Server evaluation allows you to sort on a client-side evaluated property, which means the sorting is done in the client rather than in the database server. I tried this by replacing the .First() command with .Sort(p => p. AuthorsString) in listing 2.9 and returning a list of books. In that case EF Core produces SQL code that reads all the books, then read each row individually, twice, which is definitely not optimal. EF Core’s Client vs. Server evaluation feature has some very useful features you can use to make sure you aren’t producing poor-performing. Firstly, EF Core will log a warning the first time a Client vs. Server evaluation will adversely affect performance, and this logging is intelligent. In the case of my book query that used string.Join then no warning is given because the string.Join does not affect the performance. However if I added the .Sort(p => p. AuthorsString) command then I get a warning. EF Core has a load of nice features and, at the moment, misses some EF6.x features that that I rather liked. But I think Client vs. Server evaluation is one of those great features that will help me to build queries quickly, and often at no reduction of performance. For that I am very grateful.